The 2019 Toyota Prius has some news to share: For the first time, it’s available with all-wheel drive, using the system from the Toyota RAV4 crossover SUV. With AWD, fuel economy slips slightly, but the Prius remains one of the most efficient vehicles on the road, especially in plug-in Prime form. Put aside its jetpack style for a moment: The Prius matters because of its hybrid powertrain. The Prius uses a 1.8-liter 4-cylinder engine making 95 horsepower, mated to a 53-kilowatt electric motor to produce 121 total horsepower. The all-wheel-drive system uses two additional small motors to drive the rear wheels, but they only work at speeds of up to 43 mph. Front-drive versions of the Prius use a 0.75-kwh lithium-ion battery pack, while all-wheel-drive models use a 1.2-kwh nickel-metal hydride battery that’s less compact and a bit less efficient, but more durable in cold weather. The front-wheel-drive Prius is EPA-rated at 54 mpg city, 50 highway, 52 combined. 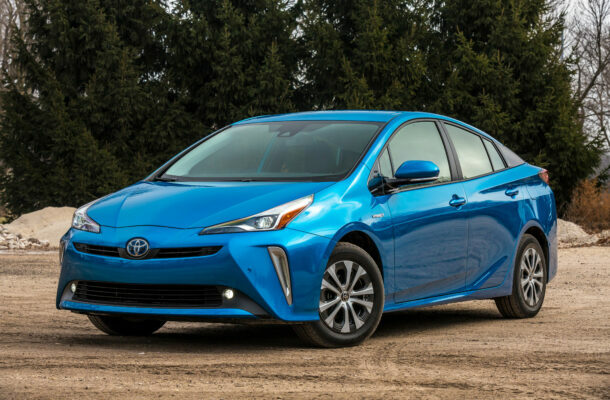 The Prius Eco, with less weight and tires with a lower rolling resistance, gets 58/53/56 mpg. The new Prius AWD-e rates 52/48/50 mpg. The Prius Prime plug-in hybrid gets 54 mpg combined when running as a hybrid, but the EPA says it can go 25 miles on electric power alone. The NHTSA gives the Prius five stars overall in crash safety, including four stars for front crash safety and four stars in the calculated rollover score. The IIHS calls it a Top Safety Pick, thanks to top “Good” scores in all its crash tests, except the passenger-side small overlap crash, where it only earned an “Acceptable” rating. Every Prius is equipped with automatic emergency braking, which the IIHS rated as “Superior” at avoiding forward crashes at 12 and 25 mph in tests. Optional safety extras such as blind-spot monitors and a head-up display are available on top trims. For 2019, Toyota has abandoned its creative but confusing model names, for the drab but simple names that mirror its other cars. The Prius comes as L Eco, LE, XLE, and Limited. The AWD-e Prius comes in every model but the L Eco, for about $1,000 more. The L Eco for $24,770 comes standard with LED lights, 15-inch wheels with plastic covers, cloth upholstery, keyless ignition, a 6.1-inch touchscreen for infotainment with Bluetooth connectivity, automatic emergency braking, adaptive cruise control, and three USB charge ports. The LE for about $26,000 adds blind-spot monitors, seatback pockets, and parking sensors. The XLE for more than $28,500 adds 17-inch alloy wheels, wireless smartphone charger, a heated steering wheel, synthetic leather upholstery, remote start, and parking sensors. The Limited for just over $33,000 adds automatic wipers, heated front seats, softer interior materials, remote start, premium audio, a 11.6-inch vertically oriented touchscreen, a head-up display, and adaptive headlights. Notable options include a sunroof and smaller, more efficient tires for XLE and Limited. This generation of Prius began in 2016 with a lower and wider body that wears relatively radical styling, which has been smoothed out and toned down in 2019. The Prius got lower and wider in 2016, but it didn’t lose its egg shape, or its horizontally split rear window. The plug-in Prius Prime softens some of the strikingly sharp lines, which still go in many directions: The Prius has a V-shaped hood, horizontal headlamps, vertical fangs on the front bumper, deep creases on the sides, and a rising liftback. The rear pillar is black, to suggest a floating roofline. The heavily styled cabin mixes hard plastics on the center console with soft surfaces elsewhere, and features touches like a glossy plastic gear selector. The standard touchscreen is a small 6.1 inches, while the top touchscreen measures 11.6 inches. The latest Prius has gained comfort and interior space, with contoured front seats and more legroom in rear, now 33.4 inches. Headroom in the rear might be an issue for taller passengers, on account of the sloping hatchback roofline. Rearward vision is restricted by wide rear pillars. There’s a decent amount of cargo space behind the rear seats: 27 cubic feet, about twice the size of the trunk of a small sedan. The Prius puts efficiency above all else. It works its modest 121 horsepower to the best of its ability. It can slip in and out of traffic at a reasonable pace. The steering is light but tracks true on the highway. Prius owners might also point out that Prius engineers know their market, and therefore put their talents into creating a comfortable ride. And that the regenerative braking is not only energy efficient, but confident in slowing the car when the driver merely backs off the gas pedal. That’s what they’re good at, and that’s what they like. The 2019 Prius has all the boxes ticked for those in search of fuel economy and practicality. It offers 52 miles per gallon, excellent safety including LED headlights, good rear legroom, a comfortable ride, and 27 cubic feet of cargo space, all for about $25,000.